What's better than ONE iPod dock? A DUAL iPod Dock! 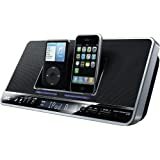 Meet JVC NXPN7 Portable Audio System with Dual iPod and iPhone Dock. There's a saying that 2 is better than 1. When 2 can get together it's special. The new JVC NXPN7 clock radio is very special. It accommodates two iPod players side-by side with its integrated dual-dock technology, charging them simultaneously and offering playback from each through the dock's speaker system. Supplementing iPod playback is an AM/FM tuner, and adding to the unit's versatility is a clock and timer. In addition, there's an analog audio input for connecting other devices for playback.